We are please to announce our club coach, Ashley Wynne. 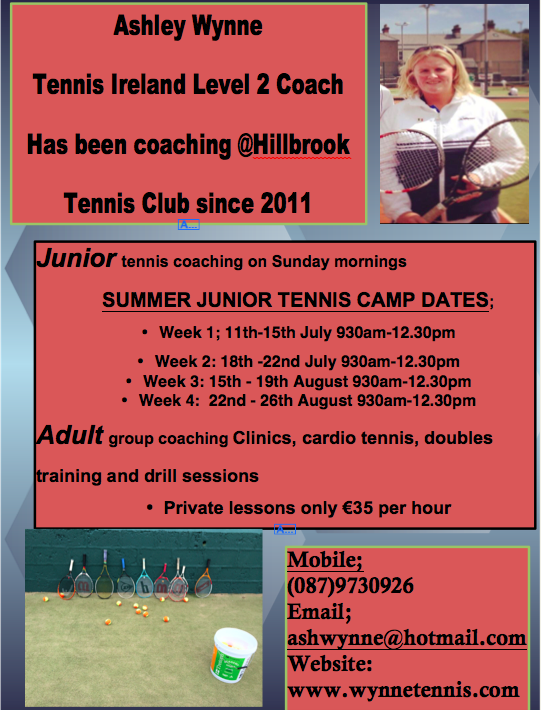 Ashley Wynne is a qualified Tennis Ireland Level 2 coach and Director of Tennis. She is also a qualified SAQ (Speed, Agility and Quickness) coach and Football Association of Ireland Kick Start 1 and 2 Coach. She has many years experience working with the top tennis coaches in Ireland and also holds a BSc Degree in Sports Management from UCD. Ashley has also represented Ireland at junior and University levels. Ashley gives lessons to players of all ages and standards. She is available for private or group lessons, cardio tennis or clinics. Adult and Junior tennis programs are available. Please make contact with Ashley and she will advise the up to date activities available.